Representative Honours: Ireland: 8 Full Caps (1882-1885). Club Honours: (with Cliftonville) Irish Cup Winner 1882/83, Runner-Up 1880/81, 1881/82. Born in Atkinson St. Hunslet, Leeds Jack Davison's father, Robert, a Flax Spinner Manager moved his family to Belfast to further his career. 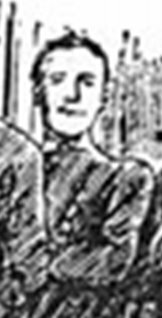 A founding member of Cliftonville Football Club, Davison played in the first ever Irish Cup Final - finishing on the end of a 1-0 defeat by Moyola Park in 1881. Another defeat followed in 1882 before Cliftonville won the trophy in 1883 with Davison scoring the final goal in a 5-0 win over Ulster. Eligible to play for Ireland under the five year residence rule, Davison played in Ireland's first international match and he was awarded the captaincy in 1883. His first match leading the team ended in a 1-1 draw with Wales - the first time Ireland had avoided defeat. He remained captain for the rest of his international career, five games in all, but could not repeat that initial success. His fifth appearance for Ireland, a 5-0 defeat by Scotland in Belfast on 26th January 1884, was the first British Championship match. Summary: 8/0. Won 0, Drew 1, Lost 7. Additional details by George Glass. Any contemporary source for calling him Jack, Jonny...? My usual query! Nothing contemporary. I'm deferring to IFFHS and George on this one.